If you want to know more about forex trading basics, you’re in the right place. All newbies should note this advice! Click here for more information! $5.1 trillion is traded on the foreign exchange market every day. Unlike the stock market, the forex market is not regulated by a governing body. This system continues to work as businesses agree to cooperate and remain reputable. The non-centralized market is what makes it easy for the daring to jump in. 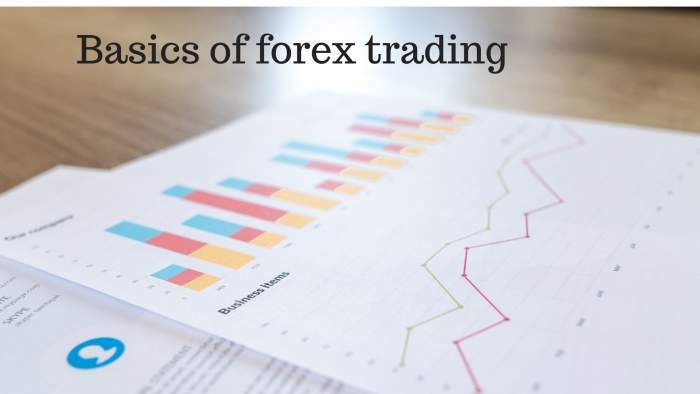 Keep reading for four forex trading basics all beginners should know. The risks of forex all involve losing money. Here few to be aware of. It’s a great benefit that an individual can start trading forex on their own. There are plenty of resources to learn currency trading. You can be very successful if you follow the principles intelligently. It’s one of many ways to make money online. Self-directed learning has an inherent risk, however. You have the potential to make mistakes based on sheer lack of knowledge. The rates of the foreign currency are subject to how a country is doing. So a change in economy or policy can drastically affect the forex market. This can lead to substantial profits or losses. The same can be said of interest rates. A rise in a country’s interest rates leads to more investments and a stronger currency. If the economy stops doing well, investors withdraw investments. This leads to a drop in price for the currency. The word scam seems to attach itself to anything happening on the Internet. Even so, it is a concern when trading currency. When you are choosing a broker to work with, do your research. You want to ensure they are reputable and have honest business practices. Newbies often make mistakes for lack of knowledge. Here are a few common mistakes to be aware of. Leveraging comes when you can set a trade ratio. If your ration is 200:1 you can trade with $1 and make a lot of money if the trade goes in your favor. If the trade doesn’t go in your favor you could lose all your money depending on your investment. Sometimes news affects the trade prices. If you go into a trade based on this information without planning first it can be very detrimental. In this social media age, people spread information about trades around like wildfire. Following these trends can hurt you if you don’t take a moment to devise a plan. You don’t want to get caught up following the trends of other newbie traders. A stop-loss is a preset order that gets you out of a trade should it turn against you. Taking a loss is a natural part of the trading process. Having a stop-loss will mitigate the damage if a trade doesn’t go as expected. PIP– “percentage in point” The smallest measurable value of movement. A PIP is 1/100th of 1%. This means a price increase of a single PIP is $0.0001 increase. Base currency– Currency you are currently holding. Quote currency– Currency you want to purchase. Ask price– Price the broker will ask you for. This is in exchange for buying your desired quote currency. Bid price– The price your broker is willing to pay for buying your base currency. Spread- The spread is the broker’s commission. It’s the difference between the bid price and the ask price. Finding the best forex brokers will depend on what your needs are. When you have a prospect, test out their platform. You’ll want to check that it is stable and works without time lags. Test their demo account for several weeks before using your own money. This is a great way to learn forex basics in real time. When you think you’re ready to use real money, start with only a small portion. Currency trading can seem very overwhelming. Learn the forex trading basics terminology. This will help you to navigate the risks inherent in a complex system. Don’t forget to practice everything you learn to increase your chances of success. Check out our website more information on becoming financially independent.